Our fantastic gold plated fashion watch is just what you need to finish off your outfit. 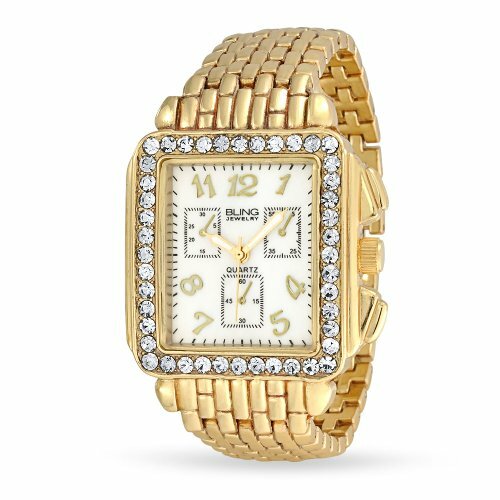 With links made of fine yellow gold plated alloy, this women's gold plated watch features a square face dial with round cut hand-set crystals on it's bezel that nicely accent the Art Deco Style numeral layout and delicate hour and minute hands. A stainless steel back guarantees top-notch timepiece quality. Capable of fitting up to an 8.5 inch wrist, this item has significant weight. A double interlocking snap closure emphasizes beauty, function and security. Get this gold watch for women today. Shine bright with this art deco inspired gold-tone, rectangular women's watch. It's white dial is adorn with 3 nonfunctioning chronograph display dials, gold-tone numbers, and it's bezel is encrusted with sparkly white crystals. It's gold-tone band and fold over clasp make this watch durable and easy to wear everyday. This watch makes for the perfect gift.